Okay, you have that never-ending box of fabric scraps -- scraps that are just too good to throw away. Now, just what to do with them? 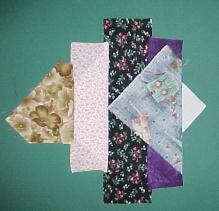 How about putting them together in a great Scrappy String Quilt! 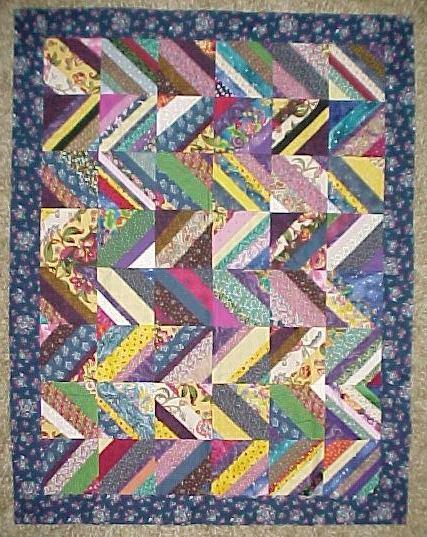 String Quilt Gallery - If you've made this quilt, I'd love to see it and I'm sure others would, too! 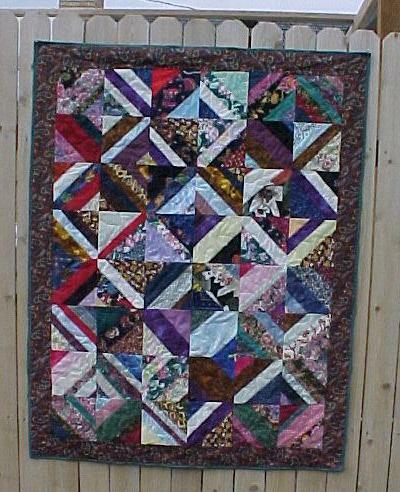 Send me an email and I'll post your picture to our String Quilt Gallery. Click here to see one more variation - all the strings going in one direction! Step by step - here we go! 1) Find fabric for the foundation. 2) Cutting the foundation squares. The fun part about making a string quilt is you can make your squares any size. 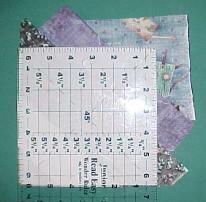 I like to cut mine 6-1/2" x 6-1/2". This makes a good size block when you put four of them together. 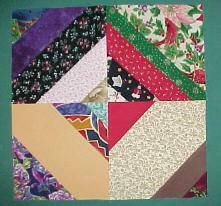 Some quilters like to work with bigger squares and some quilters like to work with smaller squares. Experiment and find a size that works for you. Cut a stack of squares. I like to cut a bunch up at one time. You'll be surprised how fast these blocks work up. 3) Set the foundation square on point. 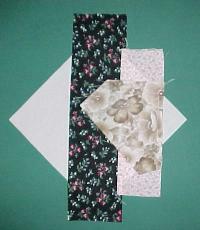 4) Select a strip of fabric that will be the center strip of your foundation square. Lay the fabric strip right sides up down the center of your foundation square. 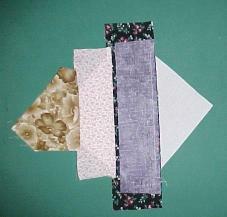 5) Select another strip of fabric. 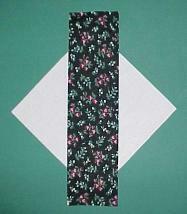 Place this fabric strip right side down on the center strip matching the edges of the fabric on the right side. 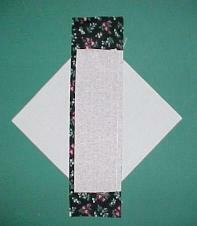 Sew a 1/4" seam down the length of the combined strips. I like to use any color thread I have an abundance of. Color of thread really doesn't matter unless you are working with really light fabrics. 6) Flip fabric strip over and press. 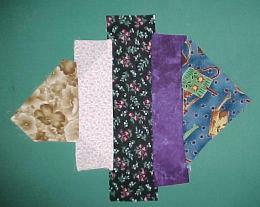 Select next fabric strip. In my example, the next strip is going to be a "corner". Place it right side down, again matching the edge of the fabric on the right side. 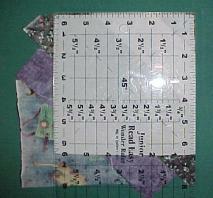 Sew a 1/4" seam down the length of the combined strip. 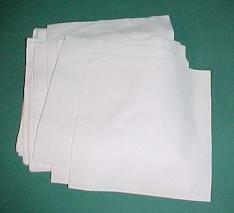 Flip fabric over and press. 7) Repeat Steps 5 and 6 for the remaining side of square. Turn over completed square. Using the foundation fabric as a guideline, cut away excess fabric. 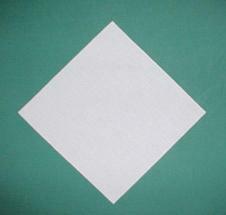 9) Combine two squares to create half of a block. Press seams to one side. Combine 2 sections to complete your block. There you have it! Your first completed block!! 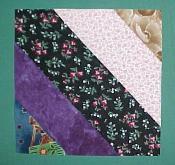 Combine blocks together to create a great Scrappy String Quilt. 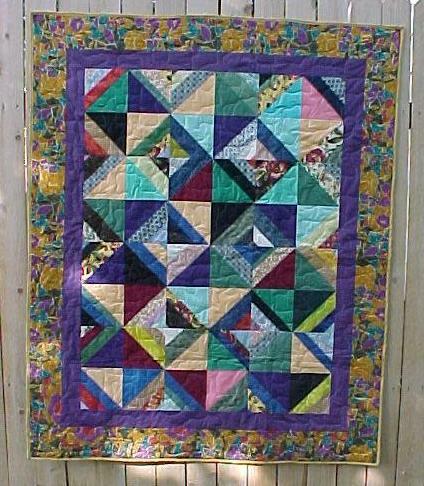 Just remember - this quilt looks great no matter what color of fabrics are used. Happy Quilting! Making the world a better place, one quilt at a time. Click here to return to my personal homepage. ©2005 Walter Times Two. All Rights Reserved. This page last updated November 15, 2005.